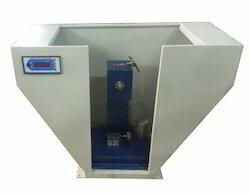 Manufacturer of a wide range of products which include impact testing machine for concrete. Owing to our vast manufacturing facilities, we are able to manufacture, supply and trade high-quality Impact Testing Machine for Concrete. The offered machine is used for impact testing of concrete. High-grade components and spare parts that are sourced from authentic vendors of the market are used in the manufacturing process.